Welcome to Mentor for Bank Exams. 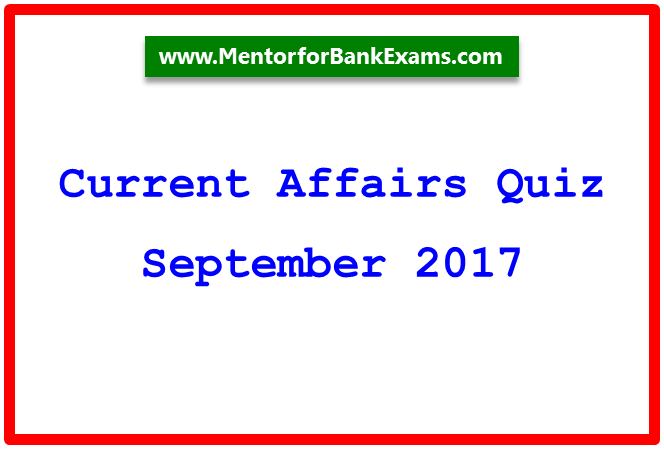 This is the current affairs questions and answers section on September 13, 2017 Current Affairs with explanation for various examination like IBPS, SBI, SSC and UPSC and many other competitive exams and interview. 1. Name the Gay rights activist who passes away recently? Explanation: Gay rights activist Edith Windsor, whose same-gender marriage fight led to a landmark US ruling, passed away. She was 88. 2. Which city is going to host 2028 Olympics? Explanation: Los Angeles will host the 2028 Olympics. The evaluation commission of International Olympic Committee (IOC) gave the formal go ahead to its bid on 12 September 2017. Today, the full IOC will award the 2024 Games to Paris and the 2028 Games in Los Angeles. 3. Name the Indian – American who has been appointed in a key position by Donald Trumph in his Communications team. Explanation: US President Donald Trump has appointed Indian-American Raj Shah to a key position in his Communications team. Shah will serve as Deputy Assistant to the President and Principal Deputy Press Secretary. 4. Reserve Bank of India introduce _____ rupees Coin to mark MG Ramachandran’s birth centenary. Explanation: As per the notification of Finance Ministry, the Reserve Bank of India will introduce 100 rupees coin to mark the birth centenary (hundredth anniversary) of AIADMK founder Late Dr. M G Ramachandran. 5. The 12th edition of the India and Japan summit will be held in which of the Indian cities? Explanation: Prime Minister Narendra Modi received his Japanese counterpart Shinzo Abe at Ahmedabad in Gujarat. The 12th edition of the India and Japan summit will be held in Gandhinagar, Gujarat. 6. Who has been appointed as the first special envoy for the oceans? Explanation: UN Secretary-General ‘Antonio Guterres’ has appointed Peter Thomson as the first special envoy for the oceans. Peter Thomson played a leading role at the first-ever UN conference on oceans in June. 7. Which city is going to open India's first transgender-exclusive clinics at government medical colleges across the state? Explanation: Kerala opens India's first transgender-exclusive clinics at government medical colleges across the state. They are planning to open Transgender Clinics in all government medical colleges in the state. Explanation: India’s first state of art virology laboratory inaugurated at Dr Anjali Chatterjee Regional Research Institute for Homoeopathy in Kolkata, West Bengal. 9. Name the payment gateway that announces its collaborations to provide users a safe and secure option to pay for rail tickets booked via the IRCTC website and Indian Railway Catering and Tourism Corporation (IRCTC). Explanation: Payment gateway provider PayU announced its collaborations to provide users a safe and secure option to pay for rail tickets booked via the IRCTC website and Indian Railway Catering and Tourism Corporation (IRCTC). Explanation: Finance Minister Arun Jaitley constituted a Group of Ministers (GoM) headed by Bihar Deputy Chief Minister Sushil Kumar Modi to monitor and resolve the IT challenges faced in the implementation of GST. It is assisted by the Chairman and Chief Executive Officer of Goods and Services Tax Network (GSTN). Explanation: Former speaker of Singapore’s parliament Mdm Halimah Yacob (63 -years) has been declared as the President of Singapore. She will become the country’s first female President and second Malay president for Singapore. Explanation: The Amendment Bill calls for increasing the maximum limit of gratuity of employees in the private sector and in Public Sector Undertakings or Autonomous Organizations under Government which are not covered under CCS (Pension) Rules, at par with Central Government employees. 13. Which payments bank partnered with the National Payments Corporation of India (NPCI) to launch a RuPay-powered digital debit card? Explanation: Paytm Payments Bank (PPB) partnered with the National Payments Corporation of India (NPCI) to launch a RuPay-powered digital debit card. The customers will now be able to transact at all merchants who accept credit and debit cards. 14. Sachin Tendulkar launches project to develop the poorest ward in Mumbai. Name the project. Explanation: Former Indian cricketer Sachin Tendulkar launched Mission-24 a programme aimed at improving the quality of life in one of Mumbai’s poorest wards through collaborative efforts in the next 24 months. The main aim of the program to provide basic amenities to residents of M-East ward that includes slums of Shivaji Nagar, Deonar and Mankhurd. 15. Maharashtra Government Tie up which among the following dairies for Milk Processing Plant. Explanation: The Maharashtra Government and Mother Dairy Fruit and Vegetable Pvt. Ltd, a subsidiary of National Dairy Development Board (NDDB) signed a lease agreement to set up a state-of-the-art milk and milk products processing plant.